The wait is finally over! We are happy to announce that a new version of SendBlaster is now available, packed with 20+ new features and major enhancements that greatly improve the overall user experience. This is not just a regular update, but a brand new major version release. In fact, SendBlaster 3 comes with an updated interface, over 260 professional email templates (30 of which are fully responsive), an improved message editor, a powerful scripting engine and much more. Over the last few months we have listened to our customers’ feedback and suggestions and have improved existing features. We have also introduced some new editing tools, like the Layout Editor, which we are sure will help you create more effective email marketing campaigns. You can download a free version of SendBlaster 3 with no expiration date or purchase the Professional version with no recurring fees for only $129.00. Are you an existing SendBlaster user? 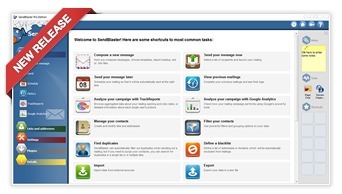 If you are using a free version of SendBlaster 2, simply download the new version. If you have purchased a SendBlaster PRO license after April 1, 2013, than you are eligible to upgrade to Version 3 at no cost! Simply visit this page to redeem it. If you purchased a SendBlaster PRO 1 or PRO 2 license before April 1, 2013, you can upgrade to version 3 at a low price. All your data (templates, email lists, …) will be imported into SendBlaster 3, even if installed in a different folder. We really hope you will like this new version of SendBlaster! Please, let us know what you think. Leave your comments and suggestions here below.